The waters of Chilkat Inlet, north of the ADF&G regulatory marker immediately north of Seduction Point will be closed to king salmon sport fishing from April 1 through June 30 (see attached map). 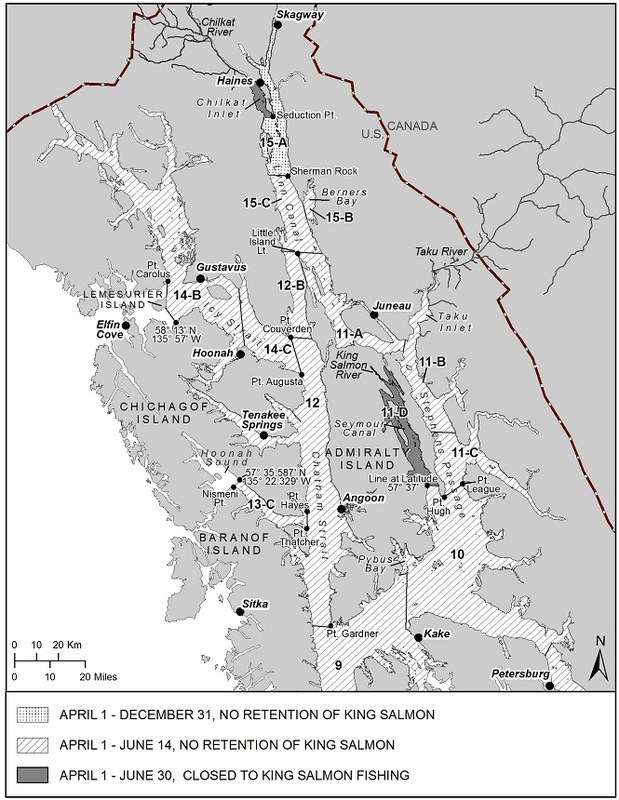 In Section 15-A, the waters of Lynn Canal north of the latitude of Sherman Rock the retention of king salmon is prohibited, king salmon may not be retained or possessed; any king salmon caught must be released immediately and returned to the water unharmed from April 1 through December 31 (see attached map). The 2018 projected Chilkat River inriver run is fewer than 1,000 large king salmon, which is below the lower end of the goal range (1,850 to 3,600 large fish). When the run forecast is below the goal range, the Lynn Canal and Chilkat River King Salmon Management Plan prescribes closing Chilkat Inlet to king salmon sport fishing through June 30. Poor marine survival rates of Chilkat River king salmon in recent years warrant additional fishery restrictions to reduce harvest and increase escapement. At the Alaska Board of Fisheries January 2018 meeting in Sitka, the board adopted the Chilkat River and King Salmon River King Salmon Stock Status and Action Plan, which specifies how the department will manage fisheries to reduce harvest of these two wild king salmon stocks until the stocks recover. These actions are being taken as part of a regionwide effort to conserve Southeast Alaska wild king salmon and to comply with provisions of the Pacific Salmon Treaty. Management actions are being taken across all Southeast Alaska fisheries, including sport, commercial, personal use, and subsistence, to reduce harvest of wild king salmon. Anglers fishing south of the Haines/Skagway area should review the news releases announcing sport fishery restrictions for the Juneau, Petersburg/Wrangell and Ketchikan areas. Regional king salmon resident and nonresident regulations scheduled to be released in April will not supersede these king salmon restrictions. For further information concerning this announcement, please contact Haines/Skagway Area Management Biologist, Richard Chapell at (907) 766-3638.